Here are my Lancaster, PA Amish Country Favorites - I've added links to the shops that have them. Feel free to pin this list, and let me know of any I've missed! 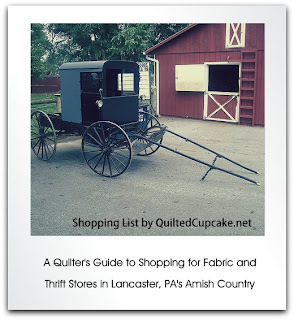 Quilted Cupcake's One Day Itinerary for shopping for quilt fabric/supplies (and other fun stuff) in Lancaster, Pennsylvania's Amish Country. Remember to start early, most shops open at 8 a.m., close at 5 p.m. Most are closed on Sunday. If you want to download this in a handy PDF, click here to visit Scribd. There are many other shops along the way, (see list below) but these are my absolute favorites. Have to see this one to believe it - amazing selection, all the newest fabrics for about 30% less than you pay at home. Kona, Moda, Henry Glass, they're all there. After you're done in the fabric area, wander downstairs and through to the little notions store - lots of unique finds there, too. Across the street from Zook's. Many bundles here, great selection of books. Amy Butler and Kaffe Fasset fabrics, and lots of batiks. Also sell finished quilts. Upstairs is the free quilt museum. Another bonus to this area: there is a kid's play area and petting zoo nearby at the Country Kettle Village. A great place to leave the kiddies and spouse while you shop. Finished quilts and fabric. Smaller selection than the other stores, but worth a trip if you have the time. Nice selection of patterns. Be sure to check out the crates with 99 cent fat quarters in the back. The Outhouse was a scream! East Earl Goodwill is a treasure trove. I've also found good items at the Lincoln Highway store. Here's a link to all of those in the area. Ephrata, PA has several thrifty shops in one area, and a quilt shop. My favorite was the Reuzit Shop - don't pay any attention to the comments on the link. This place rocks.